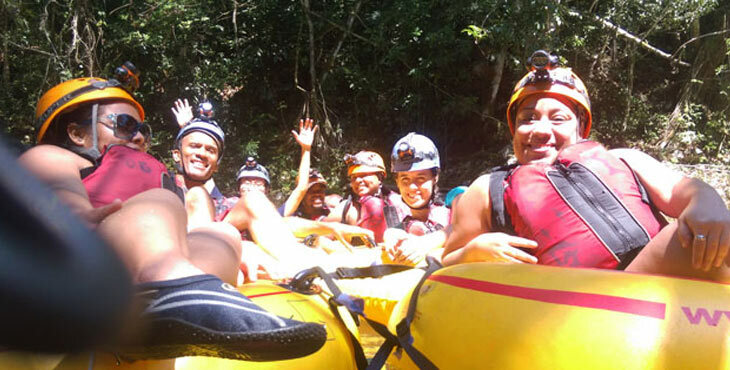 It’s not every day that the BIM team gets to experience the great outdoors but when we do, we go all out! Ready for our day of adventure! Linda’s definitely excited for ziplining. Michelle and Alicia are ready to go! Our trusty guide explaining the do’s and don’ts of ziplining. And off goes Richard on the longest line at Caves Branch. The view was amazing! Lenique is enjoying the view from the jungle top. After an eventful morning of ziplining we headed over to the cave tubing guys. Check it out! Everyone’s getting ready for some cave tubing! Down the winding road we go! And up the not so ancient staircase. Who wants to go for a quick swim? The darkness of the Mayan underworld consumed everyone’s vision. Thank goodness for flashlights! Literally, the light at the end of the tunnel! We definitely had fun! Thank you CEI! After the day’s excitement, we had a delicious lunch at Splash Restaurant – definitely worth checking out! Thank you CEI Tours for a great day and an incredible experience!